Confectionique: Confectionique's Académie: Our Creative Offerings for April! Confectionique's Académie: Our Creative Offerings for April! Hand-stitched nesting wee birds, rag swags and mosaics, oh my! We have three class offerings during our April "Le Beau Jardin" market. Space is limited and these classes tend to be quite popular, so we do suggest you send your deposit and register as quickly as you can. We look forward to seeing you, creating with you and celebrating the coming spring season with you! As always we partake in healthy snacks and tea or water to help keep our minds focused and bodies healthy. Reservations are required -- just email us or message us on Facebook. 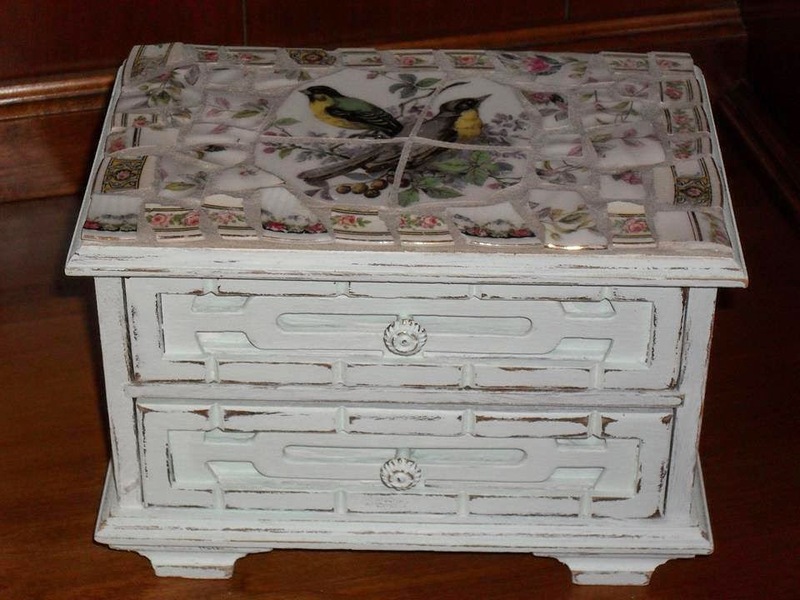 Broken China Mosaic: Back by popular demand! Connie Jean has agreed to teach another broken china mosaic class! She'll teach you how to piece together a beautiful mosaic out of vintage, broken china. Make a garden plaque, birdbath, picture frame or tray! Enrollment is limited to no more than 4. P.S. 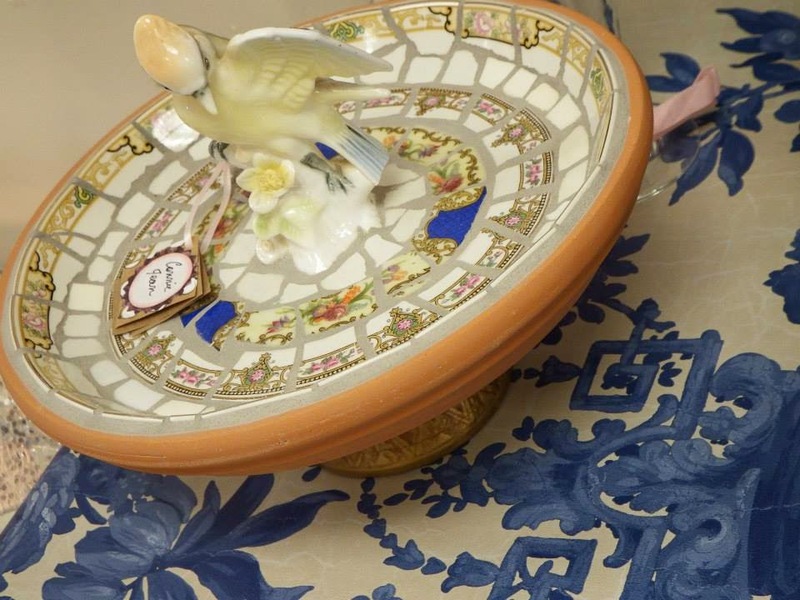 : If you have a favorite figurine or piece of broken china you would like to incorporate into your project, bring it along! Nesting Wee Bird: With this class we will work together with cotton fabric, ink, paper and wire to hand-sew and embellish this little bird. Then, we will create a nest for this little cotton-gem to rest, er, nest in! This is a process class where we begin with a pattern and see that result of our creative handy work. All supplies are included. Limit: 4 students. Rag Swag: Given all the kind comments regarding the handmade rag swag curtain across our shop window,and the request to learn to make one, I have decided to include this craft class for April. There are so many fun applications for the rag swag. It is super easy, but so much fun to do as a group. 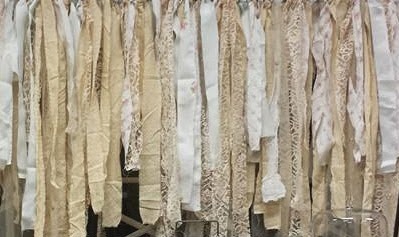 We will have scads of fabric remnants in white, off white, linen, white tulle, variety of laces, champagne and golds and many other shabby mute colors on hand. We will use our energy to cut and rip strips of fabric to make a rag swag bunting. Feel free to bring a curtain rod if you wish to make a window dressing, otherwise large jute will be provided for a bunting. If you have a special piece of fabric you want to incorporate bring that too. We can only fit 4 in this class given all the energy involved and space required.